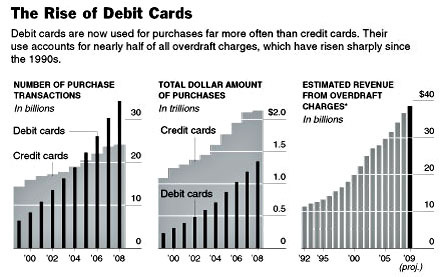 and they actively adopt policies designed to encourage overuse of debit cards. And naturally this hits the hardest among those who are the most financially stressed in the first place: 93% of all overdraft charges come from 14% of bank customers, most of them lower-income consumers. Well, of course the Fed ruled that way. Just because banks are charging the equivalent of 3,000% interest on these fees is no reason to force banks to disclose that fact to customers. That’s our Fed! But maybe the worst aspect of the whole thing is the almost unbearable smarminess of the bank lobbyist who blew off the whole subject with this: “Everyone should know how much they have in their account and manage their funds well to avoid those fees,” Scott Talbott told the Times. There’s a circle in hell reserved for this guy. UPDATE: Some practical reform suggestions here.